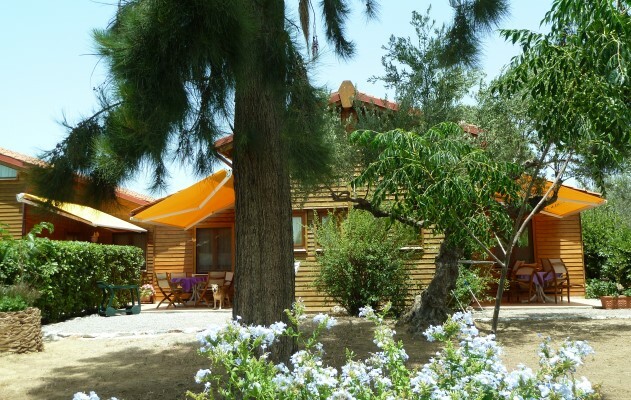 "Ktirakia" is an individual tourist complex on a small scale on an abundance of space. 8,000 square meters is the area in the form of a hill on whose plateau - at 60 m above sea level - two houses are situated next to each other and built of wood. Each of the two houses is divided into two separate units, each in angular design and maisonette style. In the rear of the houses, between olive trees, there are the parking spaces for every studio in proximity to each front door. The individual 3 x 3 sq.m large terraces are at the front of the houses towards the sea. The terraces of the two central studios are adjoining to each other, one situated a little bit back from the other. A flexible partition panel facilitates mutual privacy or can remain open in the event of related guests in the relevant two studios. The two other exterior studios, however, have their seperated terraces each for themselves. 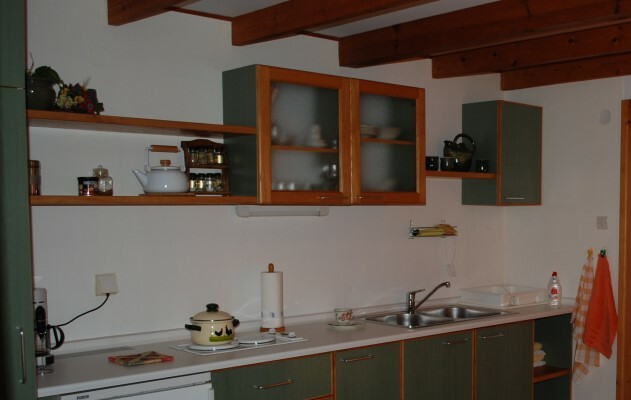 The ground floor of each of almost 40 m² Studios has a fitted kitchen carefully equipped. Opposite vis-a-vis a dining place for four people and two comfortable single beds (of 90 x 200 cm each), positioned on the corner. Beside that there is a bright bathroom of 3 m² with shower cabin, washbasin and a toilet. A wooden stairway leads to the cozy attic floor with a small clothespress, a French double bed (1.50 x 2.00 m) and a hallstand under the wooden roof slope. A baby bed is available on request and finds its space on the attic floor. 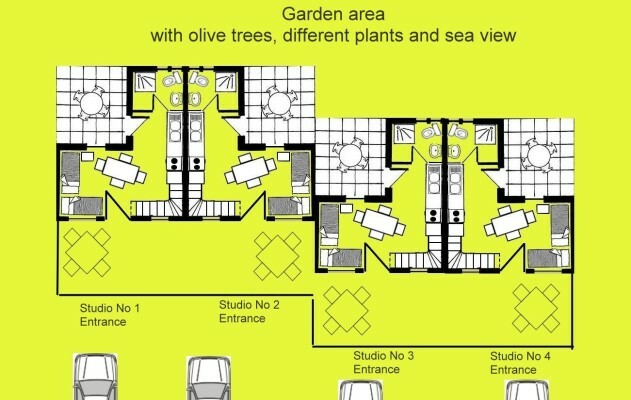 Every studio has its air conditioning and a spacious veranda with awning and seating furniture towards the sea side. An additional fixed roofed veranda with table and chairss is located in the entrance area of the studios towards the country side. 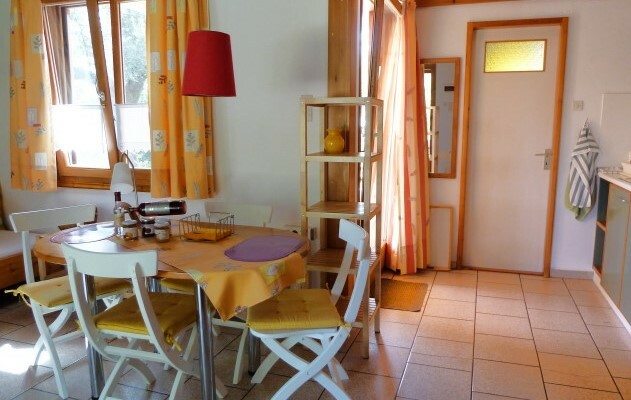 With its cosiness and functionality the studios are more than a pure accommodation. fully equiped fitted kitchen with 2 hotplatesCoffee machine, water cooker, glasses, sixfold dishes and cutlery, cookware etc. There are also a wide range of consumables, such as sugar, spices and olive oil from the in-house olive garden, dishwashing detergents, dishwashing sponges and rags, coffee filters, kitchen paper rolls and all sorts of other things - including straws and toothpicks. All four living units have a spacious veranda with awning, large round dining table and comfortable armchairs, all with views onto the garden and onto the sea. An additional fixed roofed veranda with table and chairss is located in the entrance area of the studios towards the country side. For parking its car each guest has its space in front of the entrance of his studio. 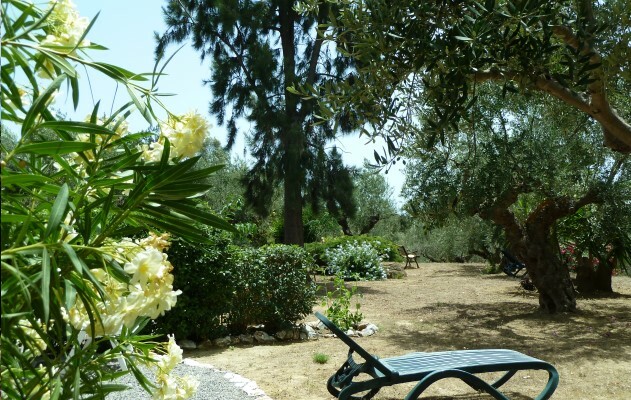 The area on which the houses of the "Ktirakia Studios" are embedded, offers a variety of flora. 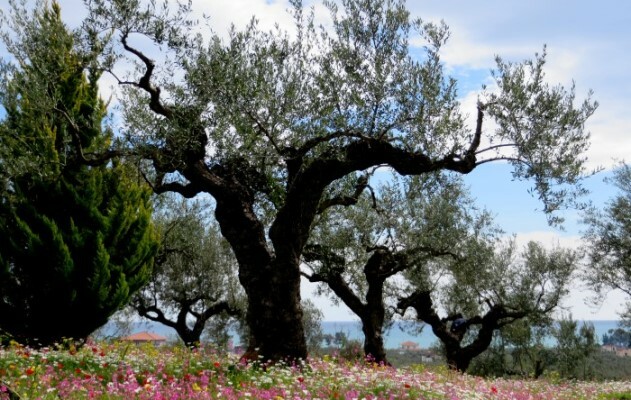 Mainly it is a olive tree hill with a large plateau, on which between the olive trees and around the houses thrive many ornamental trees and shrubs, such as palm trees, oleander, Bougainvillea, cypress, Lantana camara, bridal spar, hibiscus, jasmine, privet, and many others. A grape arbor mixed with the bright red flowering bougainvillea vines with a bench and a table below, provides shade to sit and enjoy the beautiful views across olive groves onto the sea. For relaxing there garden chairs with cushions. 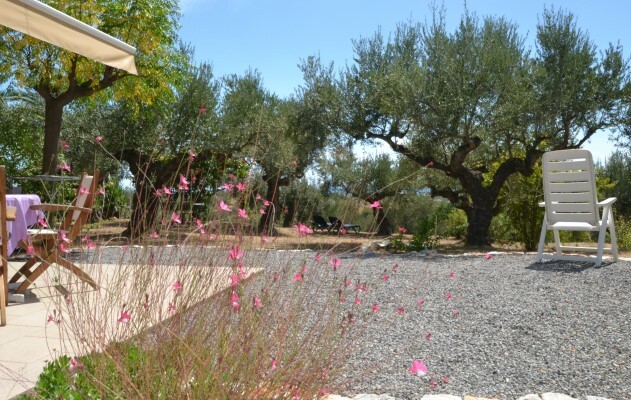 The ground of the garden is kept uncultivated, in the spring and early summer with natural ground cover with different wildflowers which make beautiful carpets of flowers. The picture is then transformed from around mid July, after this wild growth became reduced one last time through the mower, gets gradually dried up from the sun, so that parched up in the autumn months of October / November, the ground presents itself in its pure earth color. Thereby the more the other vegetation is accentuated. 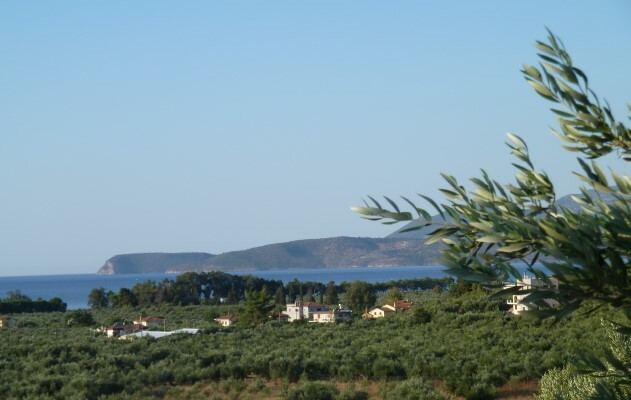 The "Ktirakia Studios" are situated on a hill 60 meters above sea level, offering lovely views of the wide blue waters of the Laconia Bay, the impressive mountains of the Taygetos mountain range and the surrounding olive groves in all their silvery shades.